The art of Syamarani Dasi is a glimpse into the spiritual world. To date, she has completed over 200 divinely inspired works for her gurus' temples and books which have appeared in almost every language througout the world. 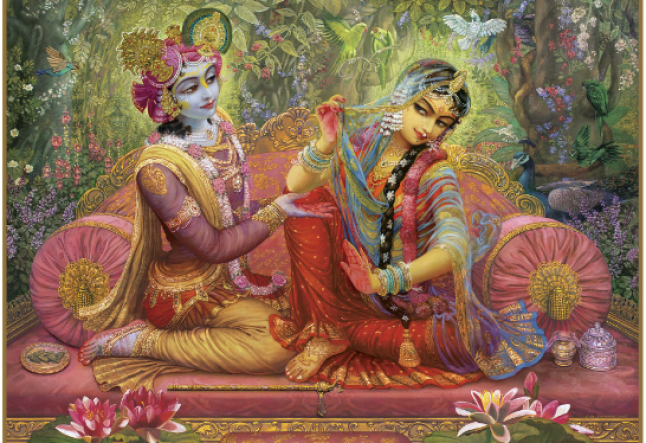 Her paintings include: Krishna and His divine consort Srimati Radharani as well as their eternal associates and her vivid creations have graced classic spiritual books such as the Bhagavad Gita and Srimad Bhagavatam. In 1966, at the age of 19, she met her guru, Srila Prabhupada, the founder and spiritual leader of ISCKON, The International Society for Krishna Consciousness. She was soon initiated and became one of his first disciples. He taught her the philosophies of sanatana dharma, the eternal wisdom of mankind as well as bhakti, the path of devotion. In 1967, she became the first art director of ISCKON and Srila Prabhupada announced to his disciples, "These paintings are windows to the spiritual world. They will be like the rain after the draught of mundane art." He left the world ten years later. Syamarani later met and took further instruction from another God-realized soul, Srila Narayana Maharaja, Srila Prabhupada's successor. Under his guidance for the last 20 years, she has created many other paintings. He once asked her, "Can you paint my heart?" He then guided her through all the details of a work that became the internationally famous Seva Kunja. The original is presently in Vrindavana India where it is now worshipped as a diety in a Krishna temple. At the end of an interview on a television show in Italy, the director of broadcasting said to Syamarani, "I just want to dive into these paintings and be there. Where they are?" She has said that the glory of her vivid paintings is that they are not the product of her imagination, but rather, every detail came from the realizations and spiritual vision of her two divine gurus. She considers herself to be a mere paintbrush who is a channel for this spiritual beauty. Syamarani became one of the first teachers of Krishna consciousness in the west and presently is honored as a teacher of this science througout the world. Syamarani's paintings combine the styles of India and the West. Her strongest western influences are the renaissance painters such as Rafael and the famous watercolor school of art. Her Indian inspirations include the works of the Brijbasi community, the artist Banarji and even some of the more stylized and primative Kangra paintings. From her Indian influences she gets inspiration regarding the authenticity of the dress, ornaments, architecture, scenery and beauty of the faces and other bodily features. From the western artists she intrgrates realism, dramatic lighting and distinct facial expressions. Syamarani paints on canvas and canvas board using water based oils. She travels throughout the world teaching Krishna consciousness and resides permanently in Krishna's birthplace, Vrindavana, India.